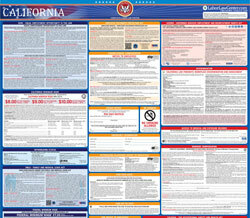 The Industrial Welfare Commission (IWC) Wage Order #1 Manufacturing Industry is a general labor law poster poster by the California Department Of Industrial Relations. This poster is mandatory for some employers, including employers in the manufacturing industry. This poster, written in Spanish, must be posted in a conspicuous place where all employees will see it for any Manufacturing Industry employers. This poster describes who is effected by the laws on this poster, definitions of any necessary terms that an employee would need to know to understand the rest of the poster, standards for hours and days of work workable by employees, and what the minimum wage is for manufacturing employees. Other information is on the poster such as information on reporting for work, licenses for disabled workers, what records should be retained by the employer, and how to deal with situations regarding cash shortages and equipment breaking. Other useful information is contained in this poster. It appears you don't have a PDF plugin for this browser. Please see the link below to download california-iwcarticle1.pdf.